I’ve been reflecting on Dexy’s this week and renewed by acquaintance with the band on Monday when I saw them play in Whitley Bay. That also made me think to this gig, by the Bureau, which I attended in 1981. The Bureau were a Dexy’s spin off band, and consisted of most of the members, apart from Kevin Rowland. “We split from Dexy’s Midnight Runners because the musical ideas we always stood for just turned into posturing”. They also featured Archie Brown on vocals (from the Upset who had supported Dexy’s on an early tour) and Mick Talbot (who is now in Dexy’s; this is confusing) or organ. I recall little of this gig; in fact I can’t even recall where it was. I suspect it was at Newcastle Mayfair (although it could have been at the Poly or University?). I do remember them as a brass driven soul band. I’ve just checked and see that they have recently reformed and that Mick Talbot is with them again (as well as being a member of Dexy’s; this is just getting confusing for me). I went to see Dexy’s on Monday, and this has encouraged me to reflect on my previous experiences of the band. This gig was the second time I saw Kevin Rowland and the band, and the last time until I saw them again this week, and it was just amazing. I’d seen Dexy’s once before at the time of Geno, in Newcastle Mayfair. They were good that night, but nothing could have prepared me for this gig. The concert was one of (I think) two which were held in a large marquee on Exhibition Park as part of a Radio One in Concert weekend. The other gig was The Boomtown Rats, and I decided to go along to one of the gigs. I’m so glad I chose this show, because it was a revelation. Part of the reason that it was so good was the surprise element. Neither Come on Eileen or the album Too-Rye-Ay had been released at this point, and the image of Dexy’s that I had in my head was of the soul rebels in their donkey jackets and wooly hats. This was the first performance of the new gyspy folk Dexy’s, and the entire crowd was just stunned when the band came on stage, Kevin dressed in a pair of dungarees and with his new curly hair cut. You could see that everyone was just speechless and totally shocked by the complete transformation that the band had undergone. They were straight into a set which drew heavily from the forthcoming Too-Rye-Ay lp with its hybrid of soul and Celtic folk. They also included Geno, and Jackie Wilson said. The rest of the band were dressed in dungarees, scarves, leather waistcoats, and what was described at the time as “a generally scruffy right-off-the-farm look”. Kevin Rowland said at the time of the new image: “These are my best clothes. Again it just feels right for the music. Everybody else is dressing up sort of straight-laced and we come in wearing these and it’s like, y’know here we are, a bit of hoedowning is even possible”. And hoedown they did. Once I got over the shock of the new image and the new line-up, I just sat back and enjoyed the music. How could you not enjoy those infectious folk tunes. This was the first time the new lp, including Come on Eileen was played live and the only time that the line-up featured the Searching for the Young Soul Rebels-era horn section alongside the Too-Rye-Ay-era strings. I knew that night that the new lp and those songs were going to be massive. Come on Eileen hit the charts and soared to number one a few weeks later and the band were back to play to a sold-out City Hall, a gig which I missed in order to see The Jam’s final North East gig at Whitley Bay (which was the right choice, but I still regret missing Dexy’s that night!). I remember going home buzzing about the gig, still not being quite able to take in or believe what I had seen. I tried to explain to my friends how good it had been, but they didn’t get it until they saw them performing Come On Eileen on Top of the Pops a few weeks later. This was one of those gigs which I wish I could return to and relive. The show was released on CD 13 years later in 1995 and features the following tracks: TSOP (The Sound of Philadelphia); Burn It Down; Let’s Make This Precious; Jackie Wilson Said (I’m in Heaven When You Smile); Come on Eileen; Respect; Soon; Plan B; Geno; Old; The Celtic Soul Brothers; There, There, My Dear; Show Me. Note. I’ve just found (30 Jan 2014) a programme for the Radio 1 Weekend, which this concert must have been part of. The weekend featured all the DJs (Tony Blackburn, Peter Powell, Keith Chegwin etc) plus personal appearances by Dexys, Haircut 100 and others. There was also a local band stage which featured among others The Toy Dolls. 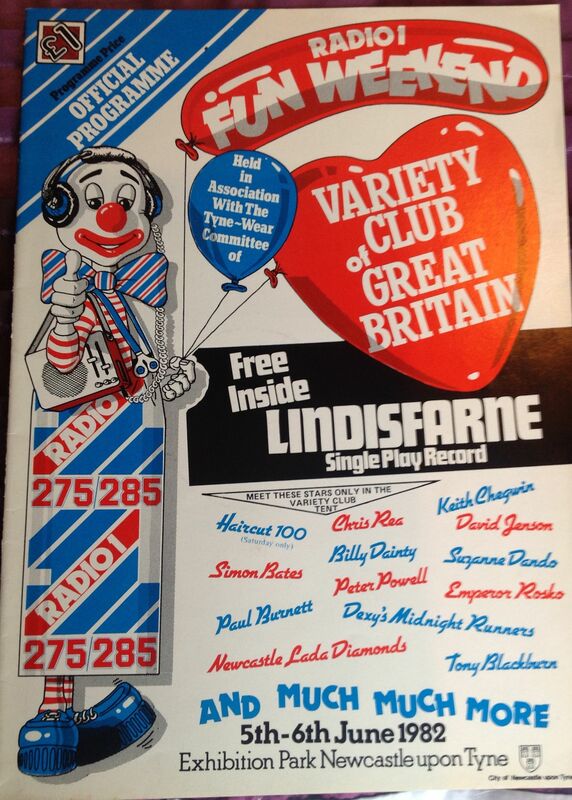 The programme includes a free flexi single by Lindisfarne (although they were not appearing as they were on tour at the time). Fascinating stuff. I’d forgotten all about this. We are going to see Dexy’s latest incarnation at Whitley Bay Playhouse tonight, and I am really looking forward to it. Kevin Rowland may be an enigma, but he is also a hero of mine. He is undoubtedly extremely talented, and puts his entire heart and soul into everything he does. I first saw Dexy’s Midnight Runners in 1980 at Newcastle Mayfair on the Intense Emotion Review. The title of the tour said it all. Kevin was determined to create a band which was a vehicle for his passion and his vision; a band with a strong image, and built on the concept of soul and emotion. Geno was a hit at the time and the band came on stage dressed in donkey jackets and woolly hats, and delivered a set of great soul and r&b. Rowland said at the time: “we didn’t want to become part of anyone else’s movement. We’d rather be our own movement” and “We wanted to be a group that looked like something…a formed group, a project, not just random”. Master of Ceremonies and resident comedian for the evening was Keith Allen (see picture; doesn’t he look young!). Support came from The Upset featuring local guy Archie Brown, and The Black Arabs. Kevin Rowland lists his listening as Astral Weeks by Van Morrison in the programme (good choice). This was around the time of their first lp Searching for the Young Soul Rebels. I remember them playing Geno, and a great version of Breaking Down The Walls Of Heartache, which is one of my favourite songs. The Mayfair was packed to the walls, and the place went mad when they played Geno; lots of singing along. At the time the band seemed to fit somewhere between The Specials, and new mod in the form of Secret Affair etc. In fact they were much more that. As Kevin said at the time: “I’m going to do what I really want to do: form a great group. We’ll wear great clothes and make soulful music.” And they did just that for a short period. The next time I saw Dexy’s was at a Radio One In Concert programme which was recorded in a marquee on Exhibition Park in Newcastle. By that time Kevin’s vision had changed into the gypsy folk which was Too-Rye-Ay, and that gig was just astonishing; one of the best gigs I have ever been to; I’ll post about that night in a couple of days. Can’t wait for tonight’s show. Will post on it tomorrow morning.